Those threads are giving me heart palpitations--yummy colors!! I've only been to market once and it was quite an experience--Sample Spree is way too much fun! Glad you had a fun trip. I love your stash - thank you for sharing. I've been to quilt market once. I hope to go again, maybe in the spring. Those bullet points you wrote sound like you've been "fabric shamed" or something like that. Have you? Is that a thing? I am not in the industry, I just read blogs and look for inspiration to quilt, but the thought that there have been times where you feel the need to explain these things is just sad! I saw the pics of fabric and thread and thought "How awesome for her!" So if anyone makes you feel bad about your haul, your stash, or the time you spend quilting, send them to me and I'll tell them to mind their own business! Thanks for sharing your fabric shopping. Waiting patiently to see what you make. I really understand when you say "These are my "paints" and I need a lot to inspire." and that is all meant in a good, supportive way. I happy for you too and would like to experience QM for myself someday. So jealous! But in a good way! Like you, we (husband & I) work very hard. We should not feel guilty about enjoying the fruits of our labours. Wow, have fun playing with them. I am glad you enjoyed Market - would love to be a fly on the wall as I don't have the credentials to attend. I hate when quilters - of any level - have to explain or appologize because they have been shamed in some way. We do what we do because we love it and work(ed) hard for it. And I love quilters who share in any form - their extras, their knowledge, their freebies, their time. You keep being you. Looking good! I'm sure you'll use it well! Enjoy! Looks like a lot of cheery inspiration for the coming darker months! When you mention washing fabric, do you wash pre-cuts? Except for fat quarters (which I have washed) the pre-cuts are not something I have much experience with and I'm curious what that might be like to wash. Hope you enjoy your new tools of inspiration. Totally enjoyed living vicariously through you. It's a lot of wonderful awesomeness. I do sometimes stress about how much fabric I have which I suppose I shouldn't...I think stressing about finances runs in my family though so it's a difficult one to change. I really appreciate you putting it into perspective. I love your fabrics, and would love to have a large and varied stash. But the truth is, I don't use my fabrics that quickly, I'm always going to find new things to love, I live in a tiny home, I have easy access to LQSs with great selections... So I will vicariously enjoy your Quilt Market experience and bounty! Thanks for sharing! Love seeing all your loot!! A friend and I went to the festival on Friday and I shopped smarter this year- less impulsive. Promised myself I would only buy fabric that made my heart sing- I know that sounds corny! When I brought my goodies home I reorganized- made a list of bundles I have, and set aside for gifting several things from my stash I no longer want. Working hard to finish up projects from this year so I can start in in the new stuff! Thanks for sharing your creativity with us all! Beautiful 'paints!' Just curious - so you will wash your new fabrics and then put them all back in their 'bundles' per se, or and to your stash by color or maybe both? Just curious what serves you best. And yay for all that gorgeous thread! What glorious color. I wish I could quilt as fast as I can buy fabric lol. I think you should be proud that you can afford to support the designers who bring us such marvelous patterns and fabrics, which you use to create and bring joy. That’s a lovely loot! You shouldn’t feel like apologizing for having a stash of fabrics and threads! Curious to see what you will create! I have a question. So you can't go to the sample spree if you don't have the right credentials? What can you get into if you don't have them? I'm hoping to go next year and confused what I can go to. Ooooooohhhh I need to do this. One day. Maybe 2018 when I'm officially an author, plus I will have enough cash by then! For now I will live through your pictures. More please. No apologies needed to those of us who aren't the jealous type. I really enjoy "After Market" posts and think it is fun to see what people go for, what grabs them, and what they enjoyed *materially* at market. I still have several treasured bundles of fabric waiting to be opened from my haul at Salt Lake City, and for heaven's sake, why not grab a few things at market to enjoy all winter long? 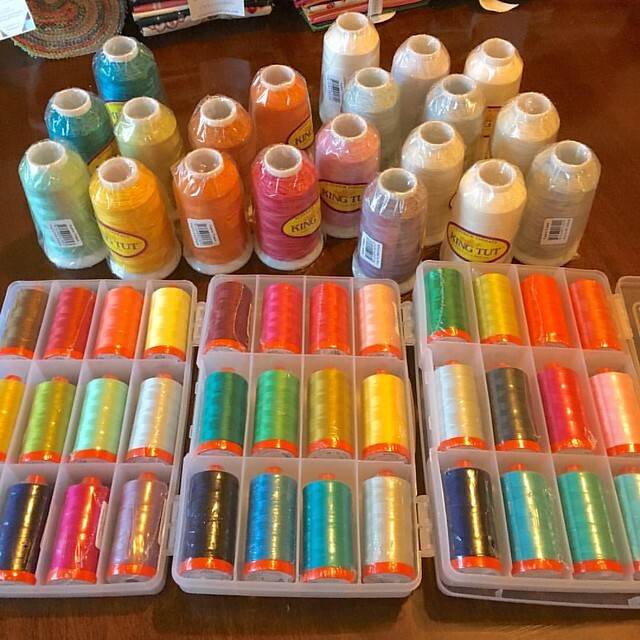 Love your haul--love your stash--and it looks like I need to stop at Superior Threads for some new thread! 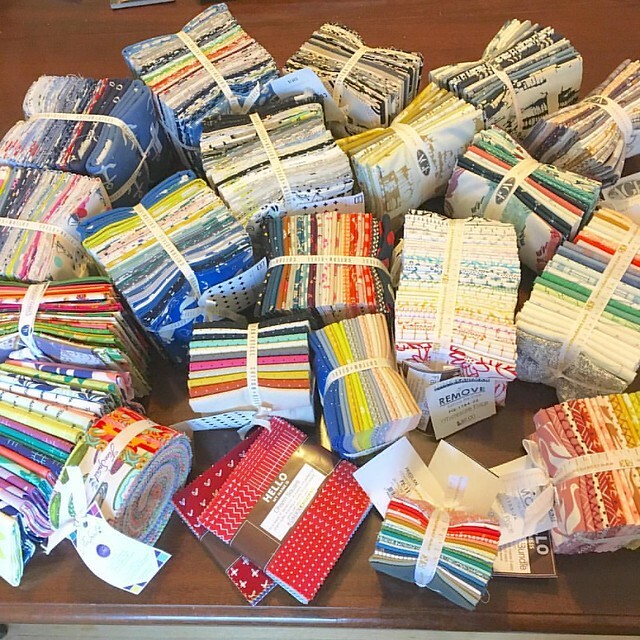 Girl, you are going to have so much fun with your new fabrics & thread!!! my first thought was "ohh that is a lot of fabric, & Thread!!" then i thought of what was in my sewing room and i have just as much but it is much older. Why is it as quilters we tend to deem older fabric (but not vintage) as not as good as the latest one out? I do this many times. OR we hoard that "older fabric" because we just can't cut into it even though we sometimes know exactly what we want to make. love your thoughts and no we aren't all the same, nor should we want to be. What beautiful fabrics and thread!I am looking forward seeing your sewing with these candies!Thanks for sharing your thoughts, through your post I made a visit to this Quilt Market :) Have a nice day! I loved reading this very honest and interesting post, enjoy all the pressing and folding! lovely colour fix. Quilt on!!!! I can see how putting all those bright lovely thread colors together is inspirational!